Though a person receives an average of 88 emails a day, email is still widely regarded as one of the most effective marketing tools at our disposal. The average open rate for marketing email across all industries is around 24% and the average click-through rate is around 4% (or 11% of opened emails). Using those statistics, you can expect to drive approximately four visits to your site for every 100 emails sent. Compare that to average click-through rates of 1.91% on Google’s search network and 0.35% on its display network, and an average CTR of 0.9% for a Facebook ad. Then factor the cost of sending email (generally, not very much), and you can see why 82% of marketers are investing heavily in email. Of course, seeing a decent ROI on an email newsletter or campaign assumes the content is something its recipients actually want to read. Bad email newsletters are a dime a dozen. Whether it’s the design, copy, or the marketing message itself, if your recipients aren’t reading and being swayed to act, you’re not going to see much, if any, return on investment. 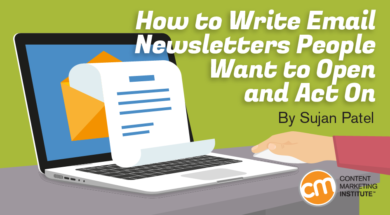 With that in mind, let’s look at how to create email newsletters your customers actually want to read. Many companies seem to believe that a newsletter is something they should create and distribute routinely regardless of what they have (or don’t have) to say. Local news media share a similar struggle, only they have to produce content every day regardless of whether any events from the last 24 hours are genuinely newsworthy. But businesses are not news media that must produce content to fill scheduled air time, newspapers, etc., because advertisers expect audiences to be informed on events in their local areas irrespective of the depth or quality of each day’s reporting. Any company that follows a similar model with their emails risks losing subscribers. Don’t want that to be your case? Make sure you’re sending emails only when you have something worth saying. Do you want to tell your subscribers a piece of company news? Share some new content? Or tempt them with an offer? Choose one topic and stick to it. Don’t pack your emails with so much content that subscribers have to work to establish whether they contain anything relevant to their needs or interests. If you must include additional topics, mention them briefly after the main body of the email. I sent this to promote a video, and as you can see, that’s what I talk about for the majority of the email. I do, however, tag on a quick P.S. to promote a podcast, and I make the most of the signature to link to my upcoming webinars and speaking engagements. This approach allows me to diversify the content of my emails while maintaining their focus. I receive poorly written email newsletters so frequently that I think the topic merits a mention. 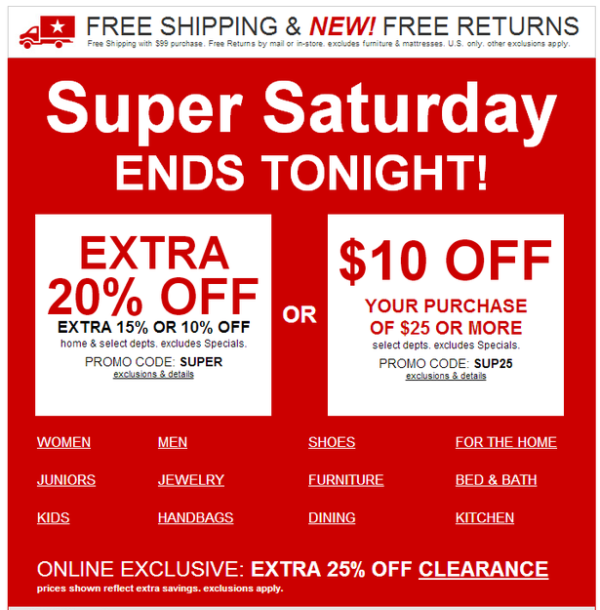 Bad copy, whether in an email or any other marketing materials, turns customers off. At best, it looks unprofessional and says you don’t care. At worst, it damages your credibility and trust with your subscribers. If you’re not a great copywriter, take a course to improve or hire someone else to do it. Not sure if you’re a great writer? The Hemingway App can help you gauge your skills and highlight ways to improve them. It’s not just the quality of your copy that’s important; the length matters too. Few people want to read 500-word emails regardless of the writing quality. That means you must hone your ability to summarize information and write persuasive calls to action that entice readers to click and find out more. 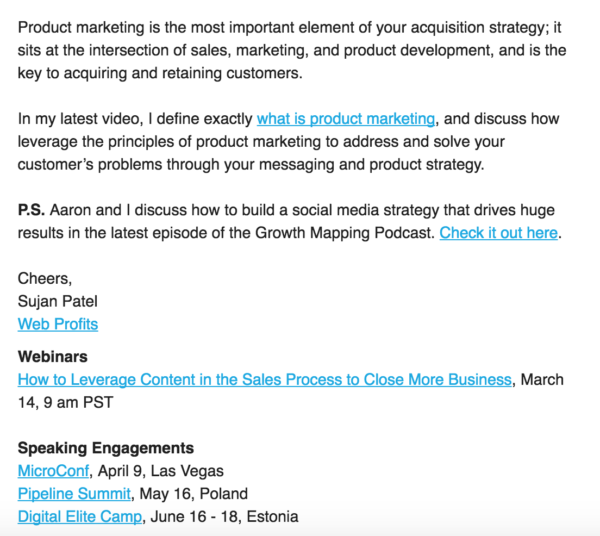 Here’s an example of an email I recently received from Neil Patel. It’s short and to the point, and gives a solid rationale as to why I should click to learn more. The majority of emails from brands I receive push offers down my throat. If it’s a legitimately great offer for something I’m interested in, then awesome. Unfortunately, that’s rarely the case. While there’s a time and a place for pushing offers in emails, do it too often and your audience is going to suffer from “offer fatigue.” Not only will they start to ignore your emails (and potentially unsubscribe), but the offers will begin to lose their value. After all, if you’re always running a “special offer,” how special is it? Instead, balance sales-focused emails with educational content. Use the majority of your newsletters to promote content that will help your subscribers, and reserve sales emails for genuinely great offers that you’re proud to promote. Personalizing your subscribers’ choices will decrease the frequency of emails irrelevant to their interests and, in turn, increase the number of emails they receive that they actually want to read. In the subscriber confirmation email, the new subscriber can pick the type of content they want to receive. They can also add in additional information like their location and age range. This information all can be leveraged to increase the relevancy of the content that lands in their inbox. 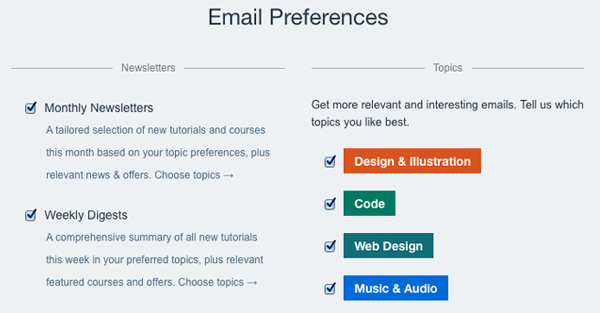 This form allows subscribers to specify the topics they’re interested in hearing about, but it also allows them to adjust the frequency and type of emails they want to receive. The quality of your copy is irrelevant (or as good as irrelevant) if the design doesn’t match up. The average user spends three to five seconds sizing up a website before deciding whether to stick around. Let’s assume users spend a similar amount of time figuring out whether the contents of an email interest them (once they’ve opened it, of course). Your email must grip your subscribers right away. If it’s too text heavy or the design looks cheap, you’re going to struggle to get results. The design feels like an ad on the back of a free newspaper (surely Macy’s can afford better designers than this) and it manages to cram in not one, not two, but three offers. Unfortunately, designing an email that reads well and looks good is easier said than done. Involve your designers in your newsletter. If you don’t have a designer – or the resources to hire one – use tools like Canva to create graphics for your emails. Of course, you don’t necessarily need to “design” an email at all. 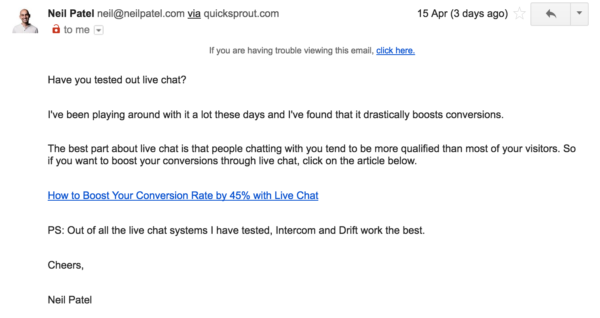 The examples from me and Neil Patel are text only. 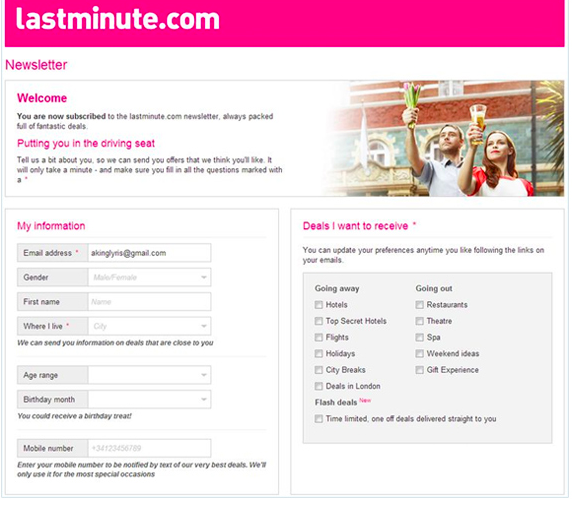 Adopt a similar approach in your newsletters and you won’t need to worry about design either. Pay close attention to which emails are being opened (and which aren’t), but more importantly, what those recipients do next. Is the copy poorly written? Does it take too long to get to the point? 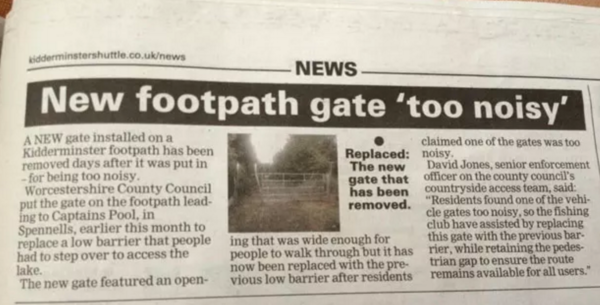 Does it try to cover too many topics? Are the calls to action unclear or just uninteresting? Is the subject matter boring? Don’t just ask yourself these questions; ask colleagues, friends, or even family what they think to help shed light on what you’re getting right and where you’re going wrong. Survey your subscribers – ask them what they want to see (and don’t want to see) in your newsletters. Implement unsubscribe-reason surveys too to ask subscribers to share their reason for removing themselves from your email list. Any halfway decent email marketing platform builds in the ability to perform split tests. If you’re not leveraging these features, you should be. They will help you refine your email writing skills until you’re creating something your customers can’t wait to read. Subject lines – These are the first step to enticing your subscribers to read more. 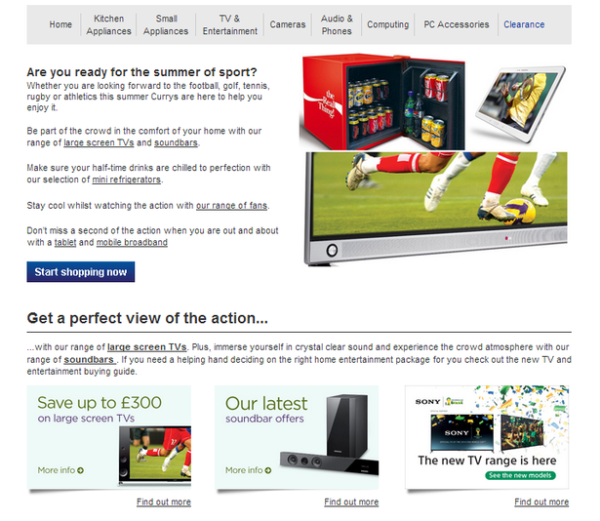 Design – What you think looks good might not match up to what your subscribers want to see. Sender name – Test your brand name against the name of an individual from your brand. Whatever you test, the most important thing is that you never stop doing it. You can always improve emails in ways that ensure that more of your subscribers are reading them, and acting on them as a result. The best way to ensure that your changes are actually improvements is to test them. Do you have other tips for creating email newsletters customers want to read? Or do you have any examples of really great (or really bad) emails to share? Comments are below – it’d be great to get your thoughts.